WidevieW can be used to create cockpits with panoramic scenery view, through multiple monitors on networked PCs. There is no limit on how many PCs can be linked together, and view angles can be easily customized, to get perfectly matching images throughout the LAN. Widetraffic is an optional module ensuring AI and multiplayer traffic synchronization throughout the network. WidevieW and Widetraffic 64-bit available also for Prepar3D v4. FS Earth Plus track your flight and get relevant flight details from a web browser of any device, simulating a real flight entertainment system that can be found on the passenger's seat of most modern airliners. Works with any flight simulator client supporting FSUIPC, including FSX Steam, Prepar3D (also the 64 bit release) and X-Plane. Uses Microsoft Bing to show a moving map of the flight with its path, along with additional flight information. Key2Mouse can be used to command through computer's keyboard, software or add-ons (for example simulated instruments and gauges) working only with mouse. A user's friendly interface, is used to define the screen's location of the hot spot area, as well as to associate the relative keystroke. Excellent for users of external hardware panels, to program custom buttons and switches, as required for own application. fs6DOFware is a software for Microsoft Flight Simulator X and Microsoft ESP, letting to use 3Dconnexion 3D mice to rotate and translate your eye point into the Virtual Cockpit easily and quickly, with a single control, without the need to remember tons of tricky key stroke combinations. Move your eye point quickly to see out of the aircraft windows or to get a better view of all the gauges. Key2LAN is similar to Key2Mouse, but works throughout your network. It sends keyboard-based commands, from a master PC to the slaves, where a user's defined mouse or keyboard action is executed. Useful to command gauges, instruments and other add-ons working on networked PCs, from the master PC's keyboard. Excellent for cockpit builders, to program custom buttons and switches. QuickGOTO keeps a database of the most frequently used departure locations (gates, parkings or runways), so it will be no longer necessary to search for the airport through Flight Simulator Airport/Facilities directory and to "Slew" the aircraft to the correct departure point each time: just select the desired location from QuickGOTO and the airplane will be instantly moved there by the software. FS SmartVIEW modifies the behaviour of mouse's wheel & buttons, adding support for intelligent and easier view rotation and zoom. Change your eye point, fine tuning the angle and looking towards any direction, in just seconds, through natural movements of the mouse or by user's defined keys. Make a pre-flight external inspection by turning around the aircraft and zooming in/out quickly. B737NG Throttle Quadrant with servo assisted (motorized) force feedback. 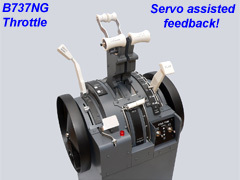 Gets input from Flight Simulator auto throttle and moves the throttle levers by servo motors. Spoiler lever is motorized too. Compatible with FS2004 and FSX, with or without Project Magenta, easy to install and use (USB Plug&Play device), through a powerful software driver. Non motorized version available also. FSC Flight Simulator Center is your professional source for Flight Simulator equipment. The TQ Throttle quadrant is servo assisted with motors, so the throttle levers move when the autopilot moves them! Carries also a full line of turnkey flight simulators. Please click HERE. Utilities and add-ons for Flight Simulator and Cockpit Builders. Google Earth, Flight Simulator, all logos and trademarks in this site are property of their respective owners. Copyright © by Luciano Napolitano*, all rights reserved.